Both climate and weather exert varying degrees of influence and control over human activity and decision-making, particularly in a country such as Canada, with its generally wide range of seasonal weather. However, in reviewing examples of such "sensitivity" to weather and climate for Newfoundland and Labrador, it must be stressed that many components of our environment exhibit a considerable degree of adjustment or adaptation to the regional climate. For the great majority of climate-sensitive activities, the seasonal rhythm of weather is reasonably well understood and anticipated. Familiar examples include (1) the agricultural sector, for which the moisture and heat requirements, and the limits of most established crops, are well defined; (2) building design standards, with regard to expected seasonal temperatures, wind and snow loading; and (3) transportation and other communication systems, and their ability to function during a wide range of weather conditions. 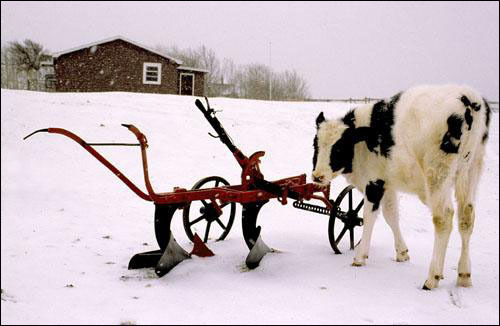 A calf huddles near some equipment on a farm near St. John's during the first snowfall of winter. Reproduced by permission of Chris Hammond. ©1992. On the other hand, certain aspects of our weather and climate can severely impact human activity and the environment. Their impacts are classified here according to whether they are a product of "normal" or "extreme" conditions. "Normal" refers to the range of weather conditions, in each season, that occurs in the great majority of years over a 20 - 30 year period. Climatic and weather extremes are distinguished by their relatively infrequent and often unanticipated occurences. For other related articles view the Climate section of the Natural Environment Table of Contents.